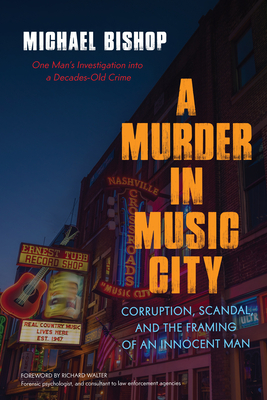 A private citizen discovers compelling evidence that a decades-old murder in Nashville was not committed by the man who went to prison for the crime but was the result of a conspiracy involving elite members of Nashville society. Nashville 1964. Eighteen-year-old babysitter Paula Herring is murdered in her home while her six-year-old brother apparently sleeps through the grisly event. A few months later a judge's son is convicted of the crime. Decades after the slaying, Michael Bishop, a private citizen, stumbles upon a secret file related to the case and with the help of some of the world's top forensic experts--including forensic psychologist Richard Walter (aka "the living Sherlock Holmes")--he uncovers the truth. What really happened is completely different from what the public was led to believe. Now, for the very first time, Bishop reveals the true story. In this true-crime page-turner, the author lays out compelling evidence that a circle of powerful citizens were key participants in the crime and the subsequent cover-up. The ne'er-do-well judge's son, who was falsely accused and sent to prison, proved to be the perfect setup man. The perpetrators used his checkered history to conceal the real facts for over half a century. Including interviews with the original defense attorney and a murder confession elicited from a nursing-home resident, the information presented here will change Nashville history forever. Michael Bishop is a sales executive for a major healthcare learning company. In 1997, he accidentally came across a file containing information about the Paula Herring case. Realizing the potentially explosive nature of the contents, he launched a multi-decade private investigation and eventually consulted with top forensic experts while piecing together the new evidence. “Bound to be one of the year’s most memorable true-crime books. A page-turner. Intriguing.